Otosome - Thursday (18/2) today, PT Hyundai Motor Indonesia (HMI) officially launched a facelift version of the Hyundai Santa Fe. The new version of the sport utility vehicle (SUV) flagship Hyundai is also a product of the new car first launched the South Korean manufacturer for the Indonesian market in 2016. The new version of the Hyundai Santa Fe itself carries the concept that leads to a more elegant and stylish European cars. Not only part of the exterior design, completeness features of the car also gets a new twist. Boyke A. Setyawan as Head of Product Planning PT HMI explained that the difference New Santa Fe on the old model is a new design that is located on the front grille, projector HID lamp, and DRL are now independent of mist or fog lamps, and LED taillights. In addition, the Hyundai Santa Fe Facelift also had skid plate and a box-shaped muffler. For additional features, New Santa Fe now has cornering lights and parking sensors on the car's face. In the cabin, the Hyundai Santa Fe new version brings bitterness in leather and can be adjusted up and down. Then All operations are now centralized because the buttons are placed in the middle of the dashboard. Additional standard features, a panoramic sunroof, dual zone climate control, AUX connector and 6 speakers. Do not forget, also adjust the suspension New Hyundai Santa Fe to be more comfortable for passengers. The suspension is now regulated more comfortable for 7-passenger, "said Boyke, as reported by Kompas Otomotif page, on Thursday (18/2). If the exterior there is a significant change, then the pacemaker kitchen space not much changed. 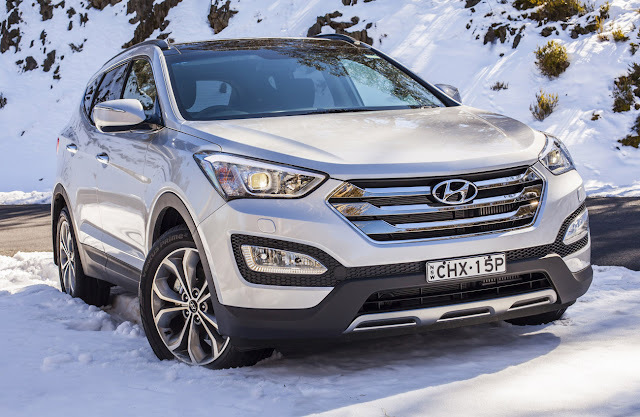 Hyundai Santa Fe facelift version is still relying on diesel engines CRD-i-powered 197 PS and 436 Nm of torque and a 2.4L gasoline MPI D-CVVT with 176 PS and 226 Nm of torque. Both machines were only available 6-speed automatic transmission. Especially for New Santa fe diesel engined three options Drive Mode: Normal, Eco, and Sport. Santa Fe Facelift is already using 19-inch alloy wheels. Whereas the type of gas available only two, Normal and Eco, following 18 inch rims. Other items that are already available in Santa Fe, the auto-brake system (ABS), electronic brake distribution (EBD), brake assist (BA), two air bags in front, immobilizer, and bulgar alarm.